It’s hard to imagine a Mexican meal without corn tortillas. Having tacos or enchiladas? Corn tortillas are integral to both dishes. Want to start with salsa and chips? Crispy thin tortillas play a starring role. Serving a spicy mole or seafood dish? Warm tortillas slathered with butter make a great accompaniment. You can buy ready-made tortillas in the grocery store, and they’re serviceable in a pinch. But they can be bit bland. In fact, when it comes to taste and texture, packaged tortillas can’t compete with freshly made. 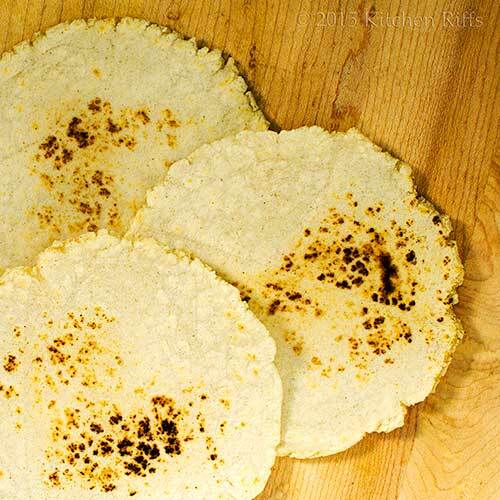 Fortunately, it takes only minutes to make corn tortillas in your own kitchen. So why not? It’s loads cheaper and tons healthier. Not to mention perfect for your big Cinco de Mayo blowout. In our part of the world, a tortilla is a form of flat bread (the word means something different in Spain; see Notes). You can make tortillas from maize (corn) or wheat flour. In Mexico, corn is a principal crop, so it’s no surprise that corn tortillas are found throughout the country. Flour tortillas are a bit more popular in northern Mexico (where wheat is commonly grown) and in the US. The dough for corn tortillas is called masa (which is Spanish for, well, dough). You can use masa made from freshly ground corn or you can use dried masa harina (which means “dough flour”—it’s the dried, powdered form of fresh corn masa). Masa harina is what you’re most likely to find at the supermarket, so that’s what we use in this recipe. Traditionally, corn tortillas contain only two ingredients: masa harina and water. Some people like to add a bit of salt and/or oil. We use the traditional recipe here, but in the Notes we discuss adding salt and oil. It’s easiest to make tortillas with a tortilla press (basically a device that flattens a ball of dough into a flat circle). But if you don’t have a press, you can use a heavy pie plate or the bottom of a saucepan (see Notes). Tortillas are baked on a griddle. We use an electric one that allows us to bake 6 at a time. But you can also do them one at a time in a frying pan. Prep time for mixing tortilla dough is 2 to 3 minutes. It then takes another 2 to 3 minutes to bake each tortilla on a griddle (so total cooking time depends on the size of the griddle you’re using). This recipe yields about 12 to 14 tortillas. They’re best when eaten immediately after cooking. But you can prepare them an hour or two in advance, and then reheat them (see Notes). If using an electric griddle: Preheat it to 350 degrees F. If using a stovetop griddle or skillet: Place it over medium-high heat. Pour the masa harina into a medium-sized mixing bowl, then add slightly over 1 cup of water. Mix the flour and water together with your hands (use disposable gloves if desired) until you form a soft dough, adding more water as necessary. The aim is to form a mixture with the consistency of soft cookie dough; it shouldn’t stick to the bowl or to your hands. If you use too little water, the dough will be dry and crumbly. Too much water will make it sticky. When you’ve finished mixing, tear off a piece of dough and roll it into a ball about 1½ inches in diameter (or a bit less). Repeat with the rest of the dough—you’ll generally end up with 12 to 14 balls (a couple more or fewer is OK). Peel the tortilla off the plastic sheet (being careful not to tear the dough) and place it on the griddle (no need to grease the griddle). Cook for 30 to 60 seconds, until the dough releases from the griddle (the process is like making pancakes—you may need to do one or two to determine how long it takes). Using a spatula, flip the tortilla over and cook the other side for another minute. Flip again, and cook until done—the tortilla will be just a bit brown. Place the tortilla on a napkin or towel, and fold the cloth around the tortilla to keep it warm. Repeat the pressing/baking process until you’ve used all the dough. Stack each tortilla on top of the prior one and cover the stack with the napkin/towel to keep them warm. Note: We often press 6 tortillas at once, then put them all on our electric griddle at the same time. We press the remaining tortillas while the initial batch is baking. But the first time you make tortillas, it’s probably best to make them one at a time so you can learn the technique. You can sometimes buy fresh corn masa at Mexican grocery stores, or at a tortilla factory (if you’re lucky enough to have one nearby). Fresh masa produces a nicer tortilla, but masa harina also works perfectly well. At our local supermarkets, masa harina tends to be shelved next to the wheat flour or near Mexican items (or both). You can also sometimes find it shelved in the gluten-free section. The Maseca® brand of masa harina is commonly available (and of good quality). But use whatever brand your grocery store has on offer. Our usual disclaimer here: We’re noncommercial and receive no compensation for recommending specific brands. We suggest only what we use and like. Don’t have a tortilla press? No problem. Just cut a plastic food bag apart as described in Step 4, and place one half on your kitchen counter. Position a ball of dough in the center of the plastic, then cover it with the other sheet. Place something large and flat (like the bottom of a heavy pie plate, or the bottom of a large saucepan) on top of the dough ball, and press down firmly. This should produce a nice, round disc of dough. Some people use a rolling pin to flatten tortilla dough. We haven’t tried it, but you may want to give it a go. If you make tortillas more than very occasionally, it’s worth getting a tortilla press. You can usually find a perfectly adequate one for under $20. As noted above, some tortilla recipes call for salt. We don’t think this is necessary, but you may prefer it. If so, just add salt to taste in Step 2 of the Procedure (maybe ½ teaspoon or so). Some recipes also add oil. We’ve never done this, but we’d vote for using extra-virgin olive oil if we were going that route. Recipes typically specify adding 2 to 4 tablespoons of oil for the amount of masa harina we use. Adding oil would likely reduce the amount of water you’d need, but you may want to experiment with quantities. BTW, we’re not exactly sure what the oil would do in this recipe. It might make the tortillas a bit more tender (though they’re fine without it). And it would probably help them stay fresh for a bit longer. You can prepare tortillas an hour or two ahead of time and then reheat them: Just wrap the tortillas in a towel and warm them in a 200-degree F oven for 15 minutes or so. Alternatively, you could sprinkle some water on a towel, wrap the tortillas in it, and heat them in the microwave for a few minutes. Or steam them (in a towel) over water in a veggie steamer for several minutes. If you typically serve bread and butter with dinner, try substituting tortillas sometime. A warm tortilla slathered with butter is seriously good stuff. And because corn tortillas are gluten free, they make a nice mealtime “bread” for people who can’t consume gluten. In Spain, the word “tortilla” means what we in the US call a frittata. The classic Spanish tortilla is a potato frittata (a recipe we need to post about one of these days). “Well, I won’t stand in your way,” said Mrs K R.
“I strive to provide a balanced diet,” I said. “Where’s the beef?” said Mrs K R.
Well, this is quite funny! I'm planning making corn tortillas tomorrow night with my new tortilla press! :) I've never been very successful with corn tortilla made by hand or even rolling them out, so I finally gave in and bought a press. It's quite fortuitous to now have your handy dandy instructions! Thanks John! Your tortillas look fantastic! Nothing is more delicious than freshly and home-made tortillas. This would be perfect to mop all the delicious sauce from the plate. Making me hungry already. Good post, John! Thank you. I have to admit that I have never made tortillas. I've bought the masa and then left it on the shelf where it became-let's say-no longer useable. Next time I'll store it in the fridge. I have used it to make tamales, but I must really try my hand at these! Thanks John! What a great GF homemade recipe... I am a fan of corn tortillas and how versatile they are. Hi MJ, a tortilla press is the only way to go. Much, much easier than trying to shape them by any other method I know. Now you have no excuse not to have freshly made tortillas all the time! ;-) Thanks for the comment. Hi Ray, aren't homemade tortillas the best? Far better than those packaged things. Thanks for the comment. Hi Abbe, good tip to store masa in the refrigerator. Or even the freezer! You really should try making tortillas -- so good. And really easy, once you get the hang of it. Thanks for the comment. Hi Denise, aren't corn tortillas wonderful? Love their flavor! Thanks for the comment. I love corn tortilla and I am not sure why I am not making homemade more often. You are giving me a great motivation to make some. I better since I am thinking of making Mexican pulled pork soon. Hi Holly, these would be wonderful with Mexican pulled pork! ;-) Thanks for the comment. Hi Shashi, corn tortillas really are so easy to make. There's just a bit of a technique to learn (how much water to add to make a dough), but make a batch or two and you'll be an expert! Thanks for the comment. You are so right, nothing compares to homemade. A few years back someone gave me a tortilla press, so I made tortillas. We couldn't believe how much better they tasted, though I like your idea of adding a little salt. Simply delicious. You are so right, homemade is always best, but I have yet to try making my own tortillas. I guess I thought it was super hard. You are also correct that Cinco de Mayo is right around the corner and I hope that you will also post some festive beverages for us before then. Adios! Hi Judy, aren't these easy to make? And so good! :-) Thanks for the comment. Hi Debra, pretty tough to beat a Margarita for Cinco de Mayo. 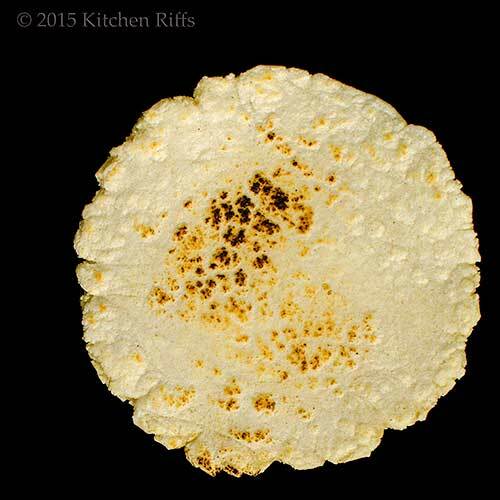 :-) It's hard to get really thin tortillas with homemade, but thicker ones are really easy. And perfect for tacos! Thanks for the comment. I admit, I use the tortilla press to make tortillas or any other bread from a gluten free flour. It's convenient and fast. But Mine never look as tender as yours. Now reading your recipe and process, I think I am probably overcooking them.. Got to fix that :D Thank you for a wonderful post. Your posts are amazing. So creative, entertaining and funny! Your wife must be a lovely lady and so lucky since you cook! I can't imagine what it would be like to come home to a meal ready to eat - yummy! These tortillas are fantastic! Can't wait for the rest of the menu. SO happy to have found your blog!!! I don't eat the corn tortillas that are sold in stores. I can't abide by the preservative smell that is so ingrained in them. However, I do adore corn tortillas. In northern India, there is a dish called 'makke di roti sarson da saag' which, when translated, means, corn tortillas and mustard greens. They are so yumm, and those tortillas always look like these. Fabulous post. Makes me hungry! These are soooo good! I like how the homemade version comes out a little thicker, too, so you get more of that corn flavor. Oh, I do love homemade tortillas and they taste much better than the standard supermarket ones. Wow, what an expert post on Tortillas and Mexican food, John... so informative. Funnily enough, we don't seem to eat much Mexican at our place... I am always curious about Cinco de Mayo too. Must look it up! Hi Ansh, if you want super tender tortillas, I suspect cooking them a bit less might be key. You might want to try a bit of oil in your recipe, too. I haven't tried it, but I'm guessing that might help tenderize them. Thanks for the comment. Hi Tricia, thanks for such a kind comment! Such a nice thing to say -- thanks. Hi Minnie, I love the combo of greens and tortillas! I need to look up that Indian dish. :-) Thanks for the comment. Hi Sue, homemade tortillas definitely are thicker than store bought ones. Or at least mine are. The only time that's a disadvantage in when making enchiladas, IMO. There ones from the store are actually a bit easier to use (they fold around the filling better). Thanks for the comment. Hi Pat, freshly made tortillas are such a treat! We don't make them nearly often enough. And when we do make them, wonder why we don't make them every day! Thanks for the comment. Hi Rachel, most of the supermarket tortillas really are kinda blah, aren't they? These aren't blah! ;-) Thanks for the comment. Hi Lizzy, Cinco de Mayo is actually a fairly minor Mexican holiday. Big in the US though -- probably just an excuse to drink Margaritas and eat tacos! ;-) Thanks for the comment. Hi Nee, making your own tortillas is fun! Sorry about your hubby's aunt -- I'm sure your help will be much appreciated! Thanks for the commment. HOW FRIGGIN' EASY! If only people knew how easy it was, so they would stop buying all the crap in the supermarket! We cannot get decent tortillas around here, so I'm delighted to have your recipe and tips! Looking forward to more Cinco de Mayo recipes! I've made hundreds of flour tortillas but have never made any corn. 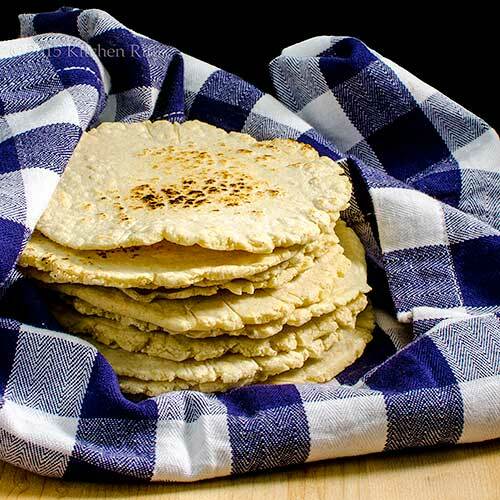 I guess it comes down to the fact that I don't have a tortilla press but now that you've made these delicious tortillas I'll have to break down and buy one. These just look amazing. Hi GiGi, making your own tortillas really is simple, isn't it? And they have such a lovely flavor! Thanks for the comment. Hi Liz, I'll bet you'll love making your own tortillas! They're truly good stuff. ;-) Thanks for the comment. Hi Karen, corn tortillas are a snap to make -- assuming you have a tortilla press. ;-) If you like corn tortillas, it's really worth investing in one. Thanks for the comment. I have never made tortilla...of any form and shape...I can imagine how homemade corn tortilla must taste...yours look awesome. Thanks for the inspiration! Getting masa harina over here isn't easy but I love corn tortillas. I have always shied away from making tortillas . . . like puff pastry. It's so convenient to buy them ready made. But I love making crepes and know they make a big difference, so I guess this is a roundabout way of telling you you're convincing me to give it a go, press or not! Hi Juliana, homemade are much better than store bought. Unless, of course, your store is a tortilla factory -- theirs tend to be best of all! Thanks for the comment. Hi Kumar, I almost never make flour tortillas for some reason -- should probably start doing that more! But I always find corn tortillas to be tastier, so that probably explains that. ;-) Thanks for the comment. Hi Maureen, I find those little hand tortilla presses to work pretty well. But I'm making only a batch or two at a time, so that's easy. ;-) Thanks for the comment. Hi Jasline, these really are simple to make. And so good! ;-) Thanks for the comment. Hi Rosemary, I always buy puff pastry ready made -- that takes time to make. And I'll sometimes buy store bought tortillas if making enchiladas. But for making soft tacos, nothing beats homemade! Thanks for the comment. homemade tortillas are the best! I love your recipe! I was eating bought one yesterday:D need to give your recipe a try! I've never made my own tortillas... these look hearty and delicious. Hi Marcela, it's really worth making your own -- so easy, and really so much better. ;-) Thanks for the comment. Hi Pam, these really are delish! And worth tons more than the little trouble they take. :-) Thanks for the comment. I make corn tortillas all the time. I just love them. I use Bob's Red Mill masa harina, and I press them between parchment by hand. I figured out that I could broil them on foil too - so easy and no mess to clean up. Hi Laura, interesting idea to broil them! I'll have to try that! Thanks for the comment. Hi Rocquie, you'll really like making these! Fun, and the flavor of your own is so good. ;-) Thanks for the comment. The adage that homemade is best certainly refers to tortillas. The ones you make yourself have such freshness and flavor. They really make you appreciate how something so simple can be so satisfying when you take a little care. I don't know about this. You make it sound easy??? Luckily for me, we have a Mexican restaurant where you can watch the gal make tortillas. And you can order them hot off the grill. I agree----boy howdy is there a difference. Reading your back and forth with your woman has given me a HUGE craving for Mexican food. I realize it's been awhile. Now that is strange for me! Hi Carolyn, homemade tortillas really are great --so much flavor! Thanks for the comment. Hi Carol, this really is an easy recipe. Of course if you have a restaurant or tortilla factory where you can buy them freshly made, that's even easier! Thanks for the comment. Great recipe - and now I'm thinking about going out to buy a tortilla press. I'm loving this Mexican series! Hi Beth, you need a tortilla press. You know you do. :D Thanks for the comment. HOw lovely. is hard to find in Malaysia. I have been wanting a tortilla press for some time. Your pictures and recipe really make me want to head over to amazon and just buy one already! I made corn tortillas at home once and they were a total bust!! I need to try them again! Hi Candy, this is much more a New World dish, so I can see how you'd have problem finding masa harina. Thanks for the comment. Hi Alyssa, I'd just go and get one -- they're really not at all expensive. $15 - $20 will do it. Thanks for the comment. Hi Ashley, I've never had a problem making them, but I've talked to people who needed 2 or 3 tries before they figured out the dough consistency, how long to bake the tortillas, etc. Give it another shot! ;-) Thanks for the comment. Hi Tisa, tortillas really are easy to make! Masa is like Play Dough -- fun to work with. ;-) Thanks for the comment. Making my own corn tortillas as been on my "to do" list for way too long. WAY! And as much SW/Mexican food that we consume in our household, I'm ashamed. Thanks for the inspiration. Hi Lea Ann, you'll love your own homemade tortillas! Great all on their own, or for using in tacos. Thanks for the comment. I'm completely impressed! I've always wanted to try to make my own tortillas, but reluctant to give it a try. This recipe is definitely pinned to give it a try. Hi Lux, it is, it is. :-) Thanks for the comment. 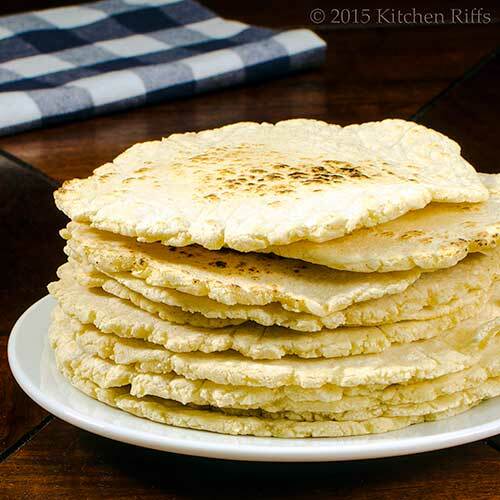 Hi Kristi, homemade tortillas are really easy! Once you try them, you'll wonder what took you so long. ;-) Thanks for the comment. Hi Charlie, tortillas are great! And they make a wonderful soft taco -- my favorite way to eat them. Thanks for the comment. 2 little ingredients and some amazing results. I have a friend who lives next door and she is from Brazil and made these for me the other day. They are just gorgeous when freshly made with a little pat of butter on top. She called them tortilla de patatas or just patatas for short. My boys gobbled up about 10 in about 10 seconds so I best quadruple your recipe! Great photos as always. Hi Bam, tortillas really are amazing, aren't they? Love them with a bit of butter! And with your boys, are you sure it'd be enough to quadruple the recipe? ;-) Thanks for the comment. I think it's intimidating to make your own tortillas at home but you make it sound easier. Hi Dedy, beef brisket would be wonderful with these! Thanks for the comment. Hi Peachy, it really is easy! And homemade taste so much better than store bought. ;-) Thanks for the comment. Hi Raymund, it's definitely worth making these -- your own have so much more flavor! Thanks for the comment. Hi Greg, you wore out a tortilla press?! I'm impressed! Thanks for the comment. Love the sound of these, perfect with homemade chilli! Hi Caroline, these would be great with chili! Perfect pairing. ;-) Thanks for the comment. Hi Claudia, it's really interesting how easy it is to make tortillas, isn't it? Before I did it the first time I assumed it was really complicated. But it's not. ;-) Thanks for the comment. John these are on my list to make this week. I can't wait to try them. Yours look perfect! HI Vicki, we love corn tortillas! In face we're having some for dinner tonight, with charro beans. :-) Thanks for the comment. I can't believe you two made your own tortillas! So very cool!!! I actually tried my hand at making my own pita bread on the griddle the other day. I have a feeling like pita bread, tortillas are 100% better made fresh! I messed up on the pita but it was still better than most store bought. I will master it one day and be ready to try my hand at tortillas! Yours look amazing! I have never made my own tortillas, after seeing your recipe you have thinking. Great recipe!! Hi Louise, I made pita bread, once, years and years ago. It was OK, but just OK -- I need to work on that! Tortillas really are a snap to make. Made some more for dinner tonight -- it really takes just minutes. Looking forward to your update! Thanks for the comment. Hi Dawn, it's really worth trying this recipe -- so quick, and the flavor is wonderful. ;-) Thanks for the comment. now i really want a tortilla press. do you know how much i don't need a tortilla press? and yet...the thought of homemade tortillas when i want them seems to justify the purchase. :) You're right: the store-bought ones are perfectly fine, but can be bland. someday...someday i'll get a press. Hi Shannon, I know all about having too much kitchen stuff! Good thing a tortilla press isn't all that expensive. :-) Thanks for the comment. I've made my own tortillas using a press before, but found that they were too thick so rolled them out myself. I haven't made them in a while, so I think I should! Hi Amanda, the press-made soft tacos do tend to be a bit thick. Perfect for tacos! But when it comes to making enchiladas, thinner tacos are better -- so it's rolling pin time. Thanks for the comment. HI Paula, breakfast tacos are wonderful, so 6 AM is a great time to be thinking of making tortillas. ;-) Thanks for the comment. I'm intrigued to try to make my own tortillas. I always like to make things from scratch and I'm always up for a new gadget (tortilla press)! Hi Bill, I have way too many kitchen gadgets! Wouldn't get rid of any of them, though. ;-) Thanks for the comment. Really! I imagined it's easy, but I had no idea that you can just mix 2 ingredients and make the tortillas right away (without resting and all the extra time). I LOVE IT! I can imagine the freshly prepared corn tortillas... I would definitely get a few more extra just because it would taste so good. I had fun reading this post - I didn't know tortilla means Frittata in Spain (and looking forward to that recipe!). I love your detailed explanation of your recipes. It's a lot of work for you to write a post, but someone like me always enjoy reading it. :) Thank you! Hi Nami, some tortilla recipes do suggest you rest the dough for 15 or 30 minutes, but I can never tell the difference between the final product -- so I never do it. ;-) Thanks for the comment.